If you have a hardwood floor anywhere in your commercial business, chances are there is an old string mop sitting in a pool of brackish water. For decades, and perhaps a few centuries, the string mop has been a staple of janitorial closets and carts; however, the string mop is an outdated and ineffective tool for commercial cleaning and janitorial services. If you are looking for a commercial cleaning service equipped for the 21st century, visit 1st Call Cleaning Services for a free 14-day trial. Our experienced and professional cleaners are ready to handle all of your commercial cleaning and janitorial needs. Call us today at 210-504-3415. The simple solution to using a string mop is to not use one at all — we’re not kidding. The typical string mop procedure involves dipping the mop in a cleaning or disinfectant solution. Then, you would spread the solution over an area and return the mop to the cleaning solution, wring out the mop and repeat. Unless you swap out the cleaning solution constantly, the water gets dirtier and dirtier with each application. As you clean with a string mop, you’re not necessarily making things cleaner. You dilute the mess or soil with the cleaning solutions, but you might actually be spreading it more. This leads to greater bacterial contamination and residue that leaves your floors scummy. Oftentimes, a dirty mop head will spread a contaminated area across the entirety of a floor without the user even knowing what is going on. Another issue with the string mop is user error. 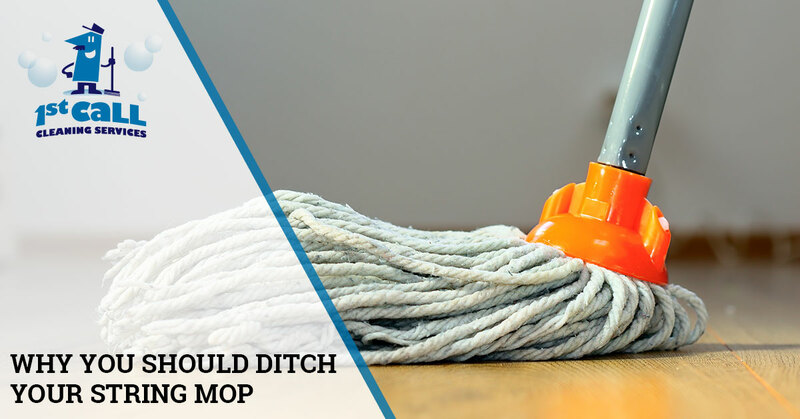 Many businesses try to extend the life of their string mops by changing the heads as infrequently as possible. A business, if they aren’t using a professional commercial cleaning service, may use the same string mop head day in and day out. As a result, the mop can contain thousands of bacteria growing within it. Some mops also emit a smell if they have not been changed recently. While the string mop cleaned the halls and restrooms of our grandparents’ schools, there have been many advancements in cleaning technology over the past few decades. One of the most important replacements for the string mop is the squeegee. The newest squeegees are made from a closed-cell foam, rubber material that stops bacterial and microbial growth in its tracks. These squeegees also have thorough rinsing designs so they don’t hold any contaminated water within them. Squeegees also have the added benefit of handling uneven surfaces better than many string mops. For example, bathroom tiles pose no threat to a squeegee. The flexible rubber cells are able to adapt to the surface and squeeze into the cracks and valleys of the floor. The overall ergonomic considerations of a squeegee make it superior to the string mop as well. Because the string mop doesn’t have a “top” side to it, you can’t outfit a scrubbing brush on the opposite side of the strings. The squeegee, however, does allow for a scrubbing brush. This saves you time on switching tools back and forth. New generations of squeegees also have flexible handles and different handle styles, preventing chronic injury from misuse and poor ergonomics. Where Has the Squeegee Been? You may be wondering why you haven’t been exposed the squeegee technology if it has been around for a few decades itself. Well, the short answer is that many companies cut corners on their cleaning costs. All too often, expenses related to cleaning are not prioritized in a business’s budget. As a result, businesses use the string mop. If you are looking to improve the cleanliness and hygiene of your business, consider investing in some quality cleaning equipment, and don’t let the string mop haunt the corners of your janitorial closet. As an alternative, if you’re a business owner in the San Antonio area, you can have a clean business for an incredibly affordable price if you go with 1st Call Cleaning Services. 1st Call Cleaning is a Top Rated Local® San Antonio business that is dedicated to commercial cleaning and janitorial services. If you are interested in having a professional, commercial cleaning service clean your business, call 1st Call Cleaners today for a 14-day free trial at 210-504-3415 or visit our website today.